Manchester City vs. Chelsea : 24 February 2012. There is little virtue to be gained in wrapping this up in fanciful words; this was not enjoyable. From the moment that I stepped out of my house on a cold Sunday morning at 8am until I returned twelve hours later, there is little that I will remember with much satisfaction or pleasure from this excursion to Manchester. Let’s be honest, though; did we really expect anything different? Even though Manchester City had been playing at a standard well below their Championship form of the previous season, they still represented one of our toughest assignments of the campaign. Additionally, our recent run hadn’t inspired me. Allied to the fact that our three most recent trips to City’s home stadium had resulted in three losses, this was always going to be a tough match. The English Champions vs. the European Champions. On another day, in another year, maybe we would have all been a bit more excited. In truth, with Manchester United walking away with the title this year, I suspected that the City fans – with their team out of the Champions League too – were as under the weather as us. Outside, there was greyness. The sky was overcast. The temperatures were cold. Manchester – here I come. I texted Alan, on his way north in one of the official Chelsea coaches, to tell him that I was on the road. He replied that he was having the first of the “pit stops” of the day. And then a message from Alan which stumped me. Maybe he was referencing “Road to nowhere” but, although this might well sum up our league campaign, I wasn’t sure that Manchester was exactly “nowhere.” Surely it was “somewhere.” I mulled over what he could have meant. Eventually, I had a more lucid response. On the M56, I spotted the sign for Hale. I was 17 minutes behind him. I repeated his message back to him. I wound my way anti-clockwise around the Manchester orbital and underneath the massive red-brick arches of the railway bridge at Stockport, the town where Chelsea played its first ever league game in 1905. Then, I edged along the slow approach to the City stadium along Droylesden Road which then became Ashton New Road. I passed through Clayton, which was once home to Manchester United from 1893 to 1910 after they vacated their first home in Newton Heath, a mile or so to the north. City’s first stadium in Ardwick was located a mile to the south of their current home. A football version of musical chairs happened in Manchester in the formative years of both clubs, with both United and City heading west from their original stadia. Until 2002, Old Trafford and Maine Road were only three miles apart. Old Trafford and the Etihad Stadium, at either side of the busy Manchester city centre, are five miles apart. On the pitch, they are as close as they have been since 1978-1979. There had been a change to the immediate surroundings of City’s new pad since my last visit. Trams were now installed and running into the City stadium along Ashton New Road. There were echoes of a distant era. With red brick houses lining the streets, I almost expected the stick-like figures of a Lowry painting to make an appearance. I parked up and braced myself as the cold wind attacked from all four directions. Just like only a mother being able to love her errant child, only a native Mancunian could muster any love for the city on a day such as this. On the short walk to the stadium, with my hands stuffed into my coat pockets, I saw evidence of City’s new-found ambition. 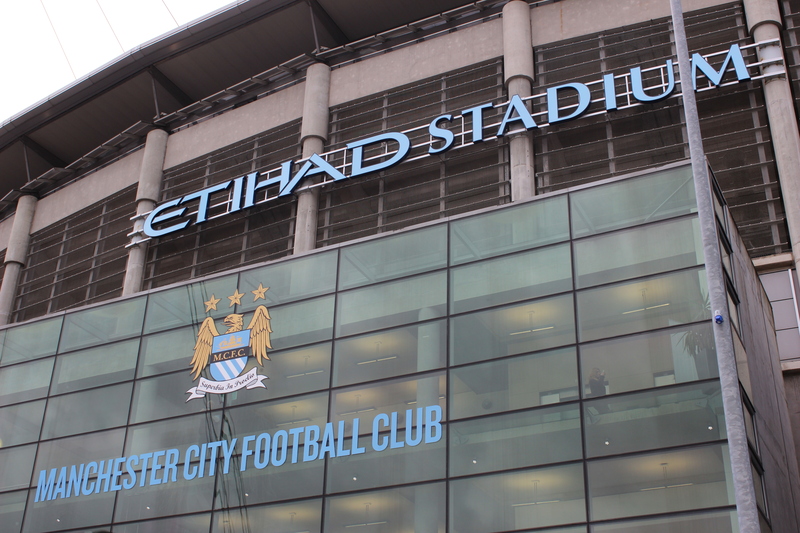 The new Manchester City academy is being constructed a few hundred yards away from the Etihad. Once completed, I think that their current training facility at Carrington – only half a mile from United’s – will return home to Eastlands. Sheik Mansoor is clearly investing for the future. City will be a main player for the considerable future. The shambling joke of the Manchester City of the Peter Swales and Taksin Shinawatra eras are now quite distant memories. I bumped into a few mates outside the stadium. The mood was typically glum. Everyone that I spoke to was of the same opinion. Rather than head inside, I took a walk around the stadium for the first-ever time. There are six San Siro style spiral staircases which allow supporters to reach the upper tiers and the sweeping roof is supported by towering pylons. It’s a relatively stylish stadium from the outside. As is the case these days, every square inch of its façade is now adorned with pictures of previous players and games. There are two “timelines.” One starts from the north stand and tells the story in pictures of the 2012 League Championship from the “Why Always Me?” game at Old Trafford in October to the Sergio Aguerro moment at the Etihad in May. The other starts at the south end and tells the story of the club through pictures and historic facts. However, there are club slogans on the spirals too. The overall effect, in my mind, is of a stadium decorated like a Christmas tree, with simply “too much” going on. I walked past some food stalls and souvenir stands until I came across the “fan zone.” A couple of supporters were being grilled on a few City questions in order to win prizes. I suggested “pie and chips” as I walked past. On the way in to the stadium, I had a quick word with the young turnstile assistant as I scanned my ticket. The young lad looked a bit sheepish and pulled a face. While I slowly slurped at a pint of Heineken, Frank Sinclair brushed past. New York and Philadelphia seemed a long time ago. He recently took control of Conference North side Colwyn Bay. It was good to see him among the three thousand away fans. I chatted to a few friends, almost dreading the moment when it was time to go inside the seating bowl. I spoke to a new acquaintance Tim (literally a friend of a friend of a friend) about the Europa League and how our minds’ are attempting to cope with it all. We have, as I have said so often before, become a rather spoilt set of supporters over these past few years. Way back in 1992, we would have sold our first born in order to see the team in Europe. These days, I get the impression that anything other than the Champions League leaves us confused and underwhelmed. Just before kick-off, it was time to go inside. Again, the away season ticket holders were in the upper tier. There were, however, a few empty seats away to my left. The view from the seats is excellent at Manchester City. The upper deck floats high above the lower deck, where Tuna from Atlanta was watching from the very front row. Above, the low clouds meant that the winter sun hardly broke through. Everyone was wrapped up in warm jackets and coats. Woollen hats were everywhere. It was bitter. The performance by the Chelsea team hardly warmed us up. It was clear from the earliest exchanges that this was going to be a tough game. However, during that barren first-half our luck held. Despite Manchester City’s better movement and a variety of chances, our defence managed to repel their shots on goal. Frankly, I was amazed at how quiet the home crowd were. The City support, like us, was clearly under the weather and feeling the pain of, once again, being second-class citizens in the city of Manchester. The atmosphere was ridiculously flat. There were hardly any positives to come from our play in the first forty-five minutes. That said, despite City’s ascendency, this wasn’t a classic display by the champions. Gary commented “it’s a sad thing if these are the second and third best teams this season.” And I had to agree with that. It hasn’t been a classic campaign and both City and ourselves have underperformed. Although Eden Hazard showed the desire amount of application and skill, elsewhere our football simply did not flow. Ramires, out wide, wasn’t enjoying his best game and David Luiz, back in the centre of the defence, was drawing groans and moans from the away support as he lost possession and gave the City attack too much space. Gary Cahill was playing well, making timely challenges and blocks, but the truth was that the majority of City’s shots were either off target or aimed directly at Petr Cech. At the break, we could easily have been 2-0 down. Demba Ba, recalled for the woeful Torres, was hardly involved in the first-half. He looked a forlorn and solitary figure as he toiled away upfront. We enjoyed our best period of the entire game during the first five minutes of the second period. A pass from deep from Ivanovic, who had been given a torrid time by City’s movement in the first half, found Demba Ba in a central position. He touched the ball past Joe Hart – a virtual spectator thus far – and the England ‘keeper clattered into him. With no hesitation, the referee pointed to the penalty spot. I raced down to the balcony overlooking the lower tier and settled myself in order to photograph Frank Lampard’s 200th. Chelsea goal. Frank struck the ball. I snapped. Hart quickly moved to his right and palmed the ball away. The Chelsea section groaned as Juan Mata was unable to follow up. With increasing frustration from the Chelsea fans – in terms of positive support for the team, the quietest for ages – City took a stranglehold on the game. Yaya Toure, he with the arse the size of Botswana, neatly forced his way past Mikel and curled a perfect shot past Cech. Mikel had been one of our better players, but had sold himself too easily. At last, the City fans made some noise. Our one chance of note involved Ivanovic playing in Ramires, one on one with Hart, but he decided against striking early and the three chasing City defenders were able to cover. Benitez, to everyone’s annoyance replaced Hazard, when our vote would have been Ramires. Lampard, not enjoying his best games, was also substituted. Victor Moses and Oscar looked out of their depth when they entered the game. Torres replaced Mikel – another of our better players – and we momentarily played with two upfront. Benitez, already receiving the ire of Chelsea supporters everywhere by leaving John Terry on the bench, caused yet more consternation. I would like to class myself as one of Chelsea’s more level-headed supporters and even I can’t stand Benitez. I feel sick just looking at him on the touchline. Our day was ruined when City scored a second with Carlos Tevez drilling the ball past Cech after a good pull back. I was right behind the shot and said “goal” as soon as it left his boot. How I never left the stadium then, I will never know. I waited for five more minutes. As the PA announcer told us of “four minutes of extra time”, I was off. The four hour drive home was hard work. As I approached Keele Services, I was suddenly overcome with crazy tiredness. My eyes were heavy and I called in for some refreshments. On the radio, I heard that Swansea City had demolished Bradford City in the League Cup Final. Listening to the erudite and courteous Laudrup speak about the game, my mind flickered into life with thoughts of him being our next manager. On the CD, the Buzzcocks were singing. This entry was posted in Season 2012-2013. and tagged 2012-2013, Frank Sinclair, Manchester, Manchester City, Stadia by Chris Axon. Bookmark the permalink.